Twilight Reimagined: I said I wouldn’t, but then I did. Okay, I’m not exactly eating my words… but I kind of am. When the news came out last fall that Stephenie Meyer was publishing a gender-swapped version of Twilight, I scoffed. And sneered a bit. And declared that it was just a greedy money grab. And laughed at the idea of the author doing a search-and-replace in her word processor (let’s see, find “Bella”, replace with “Beau”… done!). I swore that the evil corporate bloodsuckers (ugh, sorry) would not get my money this way! They didn’t. No money changed hands. But I did read Life and Death after all. Can you blame me? It was right there on the library shelf, practically daring me to take it home. And I’ll admit it — I was curious. So, first things first. It’s not as evil a scheme as I expected it to be. Twilight might seem like a thing of the past by now — remember the hysteria? The crazed midnight release parties? The insatiable hunger for photos of RobPatz? 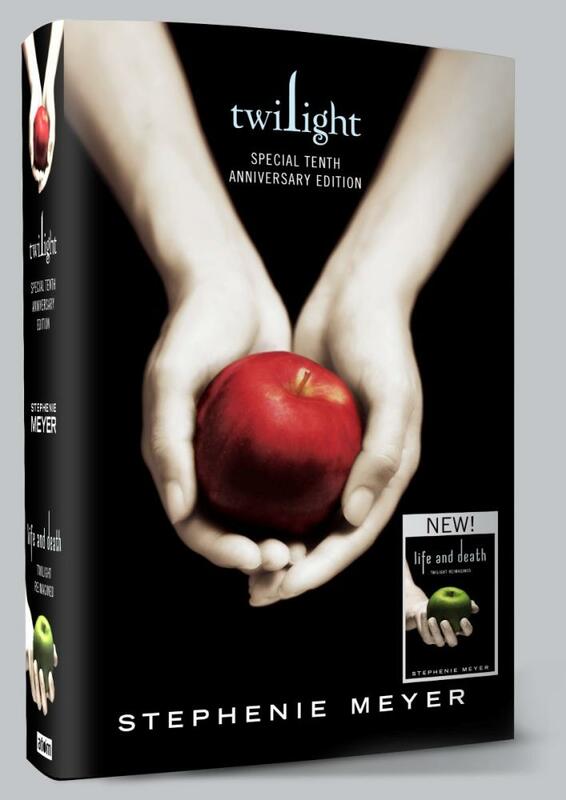 But it’s actually only been ten years since the release of the first book, and what we have here is a “special tenth anniversary edition” of Twilight, packaged with the reimagined version. This new anniversary edition is a big, hefty hardcover that’s a flip book. 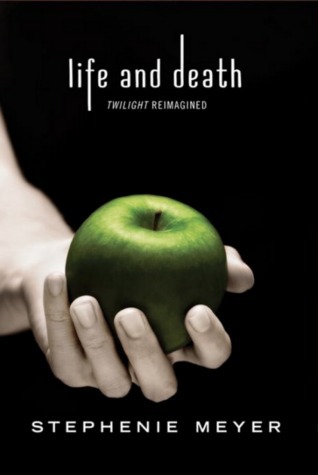 Read from one side, and it’s the original Twilight; read from the other end, and it’s Life and Death. This makes it convenient (-ish) when you get to an interlude that’s familiar but weirdly different, and you want to compare to the original. Insert bookmark, flip upside down, find the Twilight passage… huh. Not so different. Okay, so what’s the deal, and is it worth reading? Your mileage may vary. I think the thing to keep in mind is how you felt when you first read Twilight, before it became the pop culture phenomenon that swallowed up the world. I read the original book not knowing that it was a “thing”, and while I laughed at bits of it, I also couldn’t put the damned book down. It might have been candy, but it was awfully addictive candy. In Life and Death, the genders of all characters are swapped (other than Charlie and Renee, who remain Charlie and Renee — the author explains why in her introduction, although I think it could have worked with a swap too). Bella is Beau, and Edward is Edythe; and they’re still more or less the same people. Beau is awkward and trips over his own feet a lot. Edythe is (of course) the most perfectly gorgeous person who ever existed, and still drives a shiny silver Volvo. Little moments are changed. In Port Angeles, rather than Bella being pursued by a group of menacing men on the street, Beau stumbles across a bunch of drug dealers who assume he’s a cop and almost kill him. There’s rather a bit more bro talk among Beau and the guys at school, and we (thankfully) are spared scenes of them trying on tuxes to replace the girls’ dress shopping expedition. Frankly, the gender swap thing is a tolerably cute gimmick, and it mostly works (although the image of Edythe running through the forest with a gangly Beau clinging to her back made me giggle). I was really only truly irritated at one point, when (in the original), Bella is impatient and needs distraction, so she heads outside to read in the yard with a stack of Jane Austen novels. In Life and Death, Beau brings his favorite Jules Verne… and I got all righteously offended for a good ten minutes. What do you mean, Jules Verne? Males can’t read Jane Austen??? I beg to differ!!! Beyond that, it’s all mostly fine. If you like the original, you’ll probably enjoy the entertainment of reading this upside-down version of things, although to be honest, I kept forgetting who was supposed to be whom and occasionally forgot to picture Beau as a guy, or had to remind myself that Royal is Rosalie, and that the tracker vampire bad guy at the end is actually female. Whoops. Whatever. I will say that the most fun aspect (which pretty much makes it worth your time, if you’re at all curious) is that the ending is different. I suppose I should not go into how or why… spoilers, don’t ya know? Suffice it to say that it works out differently, but still goes out with a bang. No loose threads here, so don’t expect any reimagined versions of New Moon, Eclipse, or Breaking Dawn. And as to all the jokes about a gender swapped Renesmee (which here, I suppose would be something awful like Charnest? Earlie? …ugh…) — well, let’s just say that this ending makes the existence of a super-baby unnecessary. Summing it all up: If you do feel the need to find out what this Twilight Reimagined business is all about — go ahead! It won’t hurt, I promise. It might even be a little bit fun. As light-weight pop entertainment goes, you could probably do worse. I had made up my mind not to pick this book up, but your review changed my mind. No money will be changing hands either, I’m off to the library! 🙂 Great review! Interesting to read your comments on it, definitely reinforces the fact that I have no desire to read it. lol. LOL – glad to be of service! I read it curled up under a blanket on a rainy cold day this past weekend, and it was just the right way to pass the time… but I went into it knowing it was just going to be a light, fluffy piece of entertainment. I’ve wondered whether to give this a go as well. I loved the books, but hated the movies, and I sort of feel too ‘over it’ now. Your review has kind of made me want to read it though…. I think the movies made me feel pretty negative toward the entire series as a whole, so it was kind of fun to reenter the book world and remember why I enjoyed it the first time around. Haha. I keep saying the same thing, but like you, I imagine I shall end up reading it eventually! I do like the ‘flip it’ layout idea, that does seem handy! Glad it worked out to be quite a fun read. Thanks, yes, I have to admit that it was fun! Interesting!! Despite of all the opinions floating around, I wanted to read it anyways! More so now! I’ll be interested in hearing what you think if you do end up reading it! I’m actually planing on read this before the end of the month! I’ve been scoffing at its existences as well but like you I’m super curious! Twilight was actually the first book series I ever read AND LOVED! It was maybe even the books that opened my eyes to how fantastic reading is. See, for all that people now make fun of Twilight, it’s amazing to think how many people got hooked on reading because of it! I make fun of Twilight but at the same time I think without it I probs wouldn’t be the books nerd I am now! Now I sort of want to go to the library and just read the last chapter! I haven’t read any of the Twilight books, so I didn’t really care when this came out except that I read it was supposed to be for fans who complained Bella was a weak female character. Meyer seemed to miss that people were perceiving a lack of agency in Bella; making the female a vampire with special powers isn’t what they wanted a “strong female character” to look like. But, as I’ve said, I haven’t read any of the books, so I don’t know how any of the characterization actually plays out. I think Meyer’s point was that Bella wasn’t being a damsel in distress, just a fragile human surrounded by super powerful supernatural creatures. So with the new version, she put the male character in the human role to show that he’d need just as much rescuing. I’m not sure that she proved her point, really, but I understand that was a piece of the thought process. Hmm. I guess it’s easy to say that the protagonist is a fragile human surrounded by creatures with super powers. But my favorite stories are always ones like Doctor Who (back when Davies was writing) where the humans have something to offer even if they aren’t necessarily as powerful as the other characters. Maybe that’s in the books, too, though. I have no idea. I think I will most likely read this one as well, out of curiosity.